This is a first for me. I had noted all the wonderful St Clement’s Drizzle Cakes made by the members of Sweet & Simple Bakes last month and thought it would be fun to have a go myself. As this month’s bake included chocolate, I couldn’t really dip out! I mostly stuck to the recipe as given – sort of! I used 1/2 wholemeal and 1/2 white spelt flour and all my ingredients are, of course, organic. Actually, I also used less chocolate – G&B Vanilla is so rich, I thought 100g would be enough. The results were pretty good, they were crisp around the edges and a bit chewy in the middle and I like my biscuits like that. I wasn’t quite so happy with the high sugar content though and found them rather too sweet. So I was glad I didn’t use the full quantity of chocolate as stated. The flavour combination was good though, so I will be making these again – less sugar next time and maybe a bit more chocolate. Thanks go to Maria and Rosie of Sweet & Simple Bakes for this. They look lovely, love the bow. I worry about the sugar too diabeties is such a concern these days. I have recently bought some fruit sugar called Fruisana in Sainsburys which has a low GI. I am going to give it a whirl and let you know how it tastes. Thanks Lucie – would definitely be interested to know how you get on with Fruisana. Not sure if fructose is any better for you than sugar so would also be interested to know what is in it. I use rapadura sometimes as this is meant to be better for you, but it is expensive. Welcome to Sweet and Simple Bakes, we are so glad that you joined us. Your cookies turned out great! Thanks for taking part and hope the sugar content hasn’t put you off and you will join us in our next bake. Your cookies turned out great. I also love cookies that is crispy on the edge and chewy in the middle.. I agree the cookies were sweet. With the amount of sugar PLUS the white chocolate, there was no way around the sweetness. They were good though. Your cookies look great, love the addition of the ribbon! Ciao ! i love your package !! I think they would taste great with bitter sweet chocolate ! I agree, less sugar, more chocolate! That’s what I did too. Great looking cookies, hope you enjoyed them. 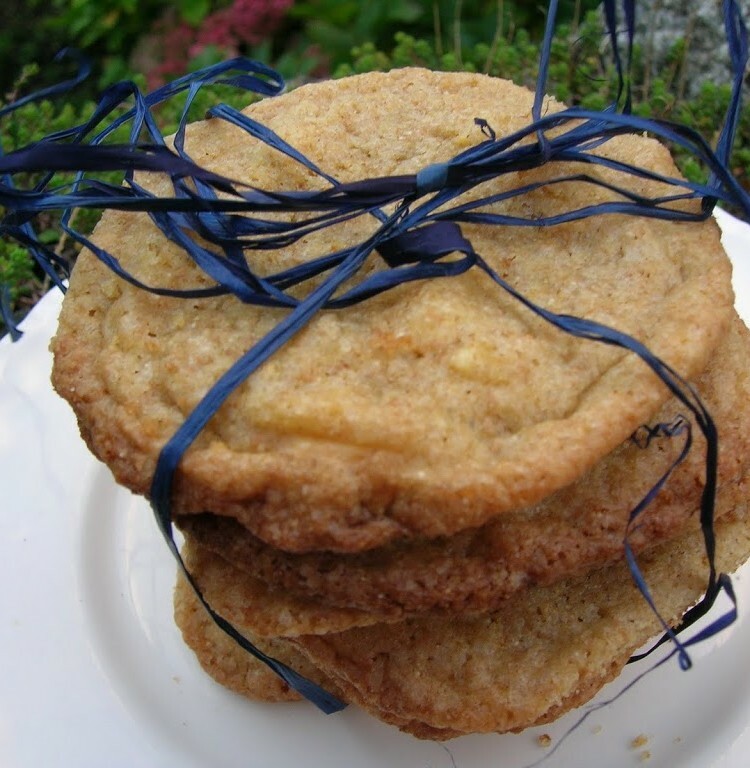 These are beautiful cookies and what lovely recipes in your blog – yum, chocolate! My niece, Lisa, lives in Penzance. I have been to Cornwall to visit her – it’s delightful. Thank you all for your kind comments – I’m now looking forward to next month’s bake. If you want to reduce the sugar in a cookie recipe, you substitute a proportion with agave nectar or sweet freedom (both from Tesco and health food shops). I use sweet freedom a lot in my cooking at home, it is made from fruit juices so is natural & easy to digest. Lots of recipes suggest that you can use these sweeteners at 100% substitution in a baking recipe, but in cookies I use up to 60% sweeteners with light or dark muscavado sugar (depending on the flavours in the cookies). This should ensure you still get the crsipy edges and crust, but the insides will stay soft and chewy. Thank you Kate – useful tips. I use agave syrup in other things as a sweetener, but haven’t tried it in cakes or biscuits yet. I’m a little dubious about using fruit sugars as I believe fructose is just as bad for you as sugar, so I might just as well stick with sugar!?? Would definitely give these a try but with milk chocolate rather than white.